How to prevent or reduce the odors of a biogas plant? The odors of a biogas plant are at the forefront of the concerns expressed by citizens when such a project is implemented in the territory. Project developers must, therefore, take into account this key issue to promote the success of the biogas plant and keep harmonious cohabitation with the local communities. How to prevent or reduce the odors of a biogas plant using an odor management strategy? What solutions can developers implement during the design and operation of the plant? Please note: This article is written for general information using publicly available sources mentioned below. If you are planning a biogas project, please make sure to connect with a professional company to discuss applicable standards in your country. What causes the odors in a biogas plant? In short, the developer must understand the issues that may arise and find the specific causes of the problem. This will help find the appropriate solution. Managing the odors of a biogas plant: where to start? To reduce the odors of a biogas plant, or to prevent them, the project developer starts by establishing a strategy. It is a step to do at the design stage of the project or once an odor problem arise during the operation of the plant. In addition, the project developer must ensure compliance with all regulations associated with the odors of a biogas plant. Evaluating odors that come from or could come from a biogas plant is the basis of an effective odor management strategy. 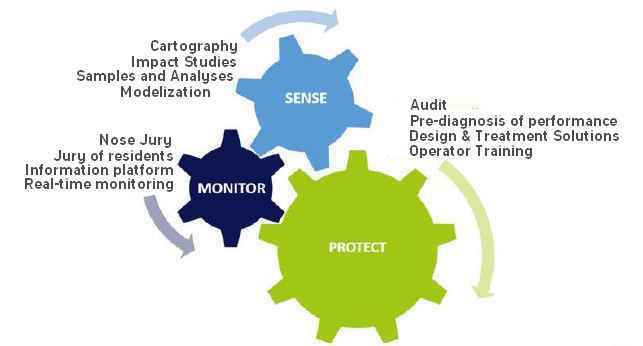 This analysis is essential both at the project implementation stage and during the plant’s operation. During project design, rigorous planning is required to assess and prevent the odors of a biogas plant. The impact study consists of the initial evaluation of odors in the place where the plant will be located. It acts as a point of reference and includes the analysis of the plant’s impact on the environment and the mitigation measures to be taken. The project developer must also pay attention to the chosen location of the plant. For example, the distance between the plant and residential area or frequently used/visited areas and the source of the treated materials will be of importance. The regular evaluation of the odors coming from the biogas plant, the follow-up and the monitoring of these must be part of the operation of the project. Through an audit, the developer will evaluate the factors mentioned above in case of odor problems will determine the source of these problems and find the solution. The project developer can choose from a wide range of solutions to prevent and reduce odors coming from a biogas or anaerobic digestion plant. What is the best combination of solutions? To get the answer to this question, the developer must look at the specific characteristics of his project and the odor analyses done previously. Solutions to prevent and reduce the odors of a biogas plant also apply to its logistics and processes. These must be carefully planned and optimized, especially when they involve the transport, storage, unloading or loading of organic materials. In addition to implementing technological or technical solutions, the project developer can call on specialized resources and the skills. This type of approach involves a variety of options: the project developer can hire a specialized resource as a consultant, train the staff to the problem of odors and ways of limiting them. 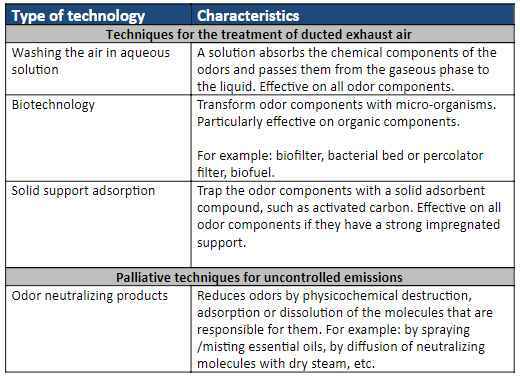 Here are some examples of possible ways to apply the previously mentioned solutions for odor management in a plant. Located in Ohio, the plant has hired a coordinator to respond to odor complaints coming from the local population. This role aimed to to monitor the company’s 8 biogas plants and to support the direct line for citizen complaints about odors. In this article, the company explains how they managed to stop unwanted plant odors usinga well-developed odor management strategy. Located in Vancouver, the biogas plant produces compost and energy. It relies on a protocol for collecting data on odors, weather conditions, inputs, and process. 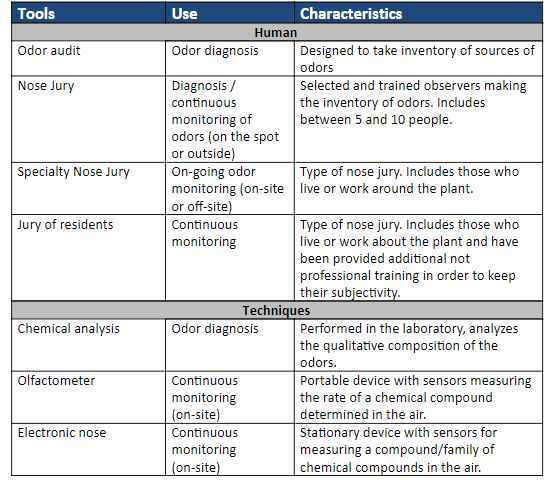 On-site operators warn their supervisor of changes in odors, and a dosimeter tracks them over time. All citizens’ complaints are documented, archived, analyzed, and compared, to meteorological data collected to ensure the continuous improvement of the process. Their odor management strategy for the plant [PDF, English, 510 KB] is available online. Communicating with communities providing the right information at the right time is to prevent problems that may arise from the odors of a biogas plant. The project developer thus establishes harmonious and trusting relationships with the population living around the project sites. This article discusses in greater depth the principles of social acceptability of biogas projects and collaboration with the population. Need help? Our members can give you a hand! Do you need help finding the ideal technology that will reduce the odors of your project? Several members of the BiogasWorld catalog could meet your needs. Check out our catalog of companies and technologies.